An 18-year-old woman claims that she is currently being held against her will in a Bangkok hotel room after being ‘abducted’ from the arrival gate by Saudi Arabia diplomatic staff. The use of artificial intelligence (AI) and big data offers untapped opportunities for Thailand. What appeared to be like morning fog in and around Bangkok this morning was not actually fog but dust particles which pollution control experts said are worsening air quality in and around the metropolitan areas. About 100 pro-poll activists organised a peaceful rally at Victory Monument on Sunday to show their opposition to any attempt to defer the general election. As student outrage about the election delay pushed the Twitter hashtag “Delayed Again. You Mother******” into the national and global top 10, the Prime Minister has responded, but students continue to channel their frustration. 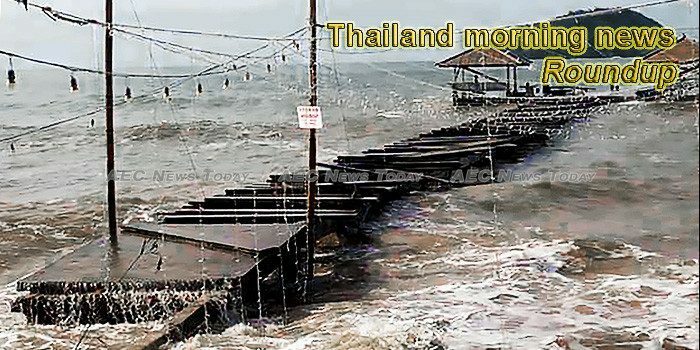 The Small and Medium Enterprise Development Bank of Thailand (SME D Bank) is introducing a loan scheme to rehabilitate businesses battered by Tropical Storm Pabuk. National Legislative Assembly President Pornpetch Wichitworachai has warned critics to refrain from blaming the coronation ceremony for causing a potential delay of the election. Thailand authorities should immediately halt the planned deportation of a Saudi woman who says she is fleeing domestic abuse and fears for her safety if forcibly returned to Saudi Arabia, Human Rights Watch said today. Key political players have reacted guardedly on the possibility of election delay, whereas March 10, March 17 and March 24 have emerged as potential new dates to replace February 24. High prices for medicines and medical services at private hospitals have been draining money from consumers’ pockets and are increasingly challenging the healthcare sector in Thailand. The Consumer Confidence Index (CCI) was recorded at 79.4 points in December 2018, a drop of 1.1 points on the previous month. Air pollution caused by hazardous particulate dust matter is set to worsen again in the capital, the Pollution Control Department (PCD) has warned. Now the actual storm has passed, a media storm is brewing over two key issues – tourists claiming they had little knowledge about the approaching storm and local tour operators, especially in the Andaman region, who say the media coverage was ‘hyped’ and overblown. Thai immigration authorities denied late Sunday that they had detained a Saudi teenager who arrived earlier in the day on a flight from Kuwait and who claimed her life was in peril if she were forced to return home. Prime Minister Prayut Chan-o-cha and his entourage will fly to Nakhon Si Thammarat on Monday to see the damage caused by tropical storm Pabuk — now downgraded to a low-pressure area — and visit storm-hit people, prime minister’s deputy secretary-general for political affairs Puttipong Punnakanta said on Sunday. The Ministry of Energy has organized a seminar on policy communications for its personnel nationwide, especially on conveying energy policy facts to local stakeholders. Sunil Chhetri overtook Lionel Messi in international goals as cricket-mad India stunned Thailand 4-1 at the Asian Cup football tournament on Sunday (Jan 6), the veteran striker scoring twice in their Group A opener to surpass the Barcelona superstar. Chalong Pier has been back to normal today following the lifting of the ban on boats leaving port last night. It could hold the key to the balance of power in Thailand: the new constitution has changed the way members of the House of Representatives are elected. The e-visa system which is jointly launched by the Ministry of Foreign Affairs in cooperation with Kasikorn Bank will facilitate visa application for Chinese tourists, and will ease the crowdedness at Thai consular offices where Chinese tourists normally visit to apply for visa. The Ministry of Commerce is monitoring the supply of everyday products in all areas affected by Tropical Storm Pabuk (ปาบึก), which has downgraded into a depression and is heading toward the -Andaman Sea. The tropical storm that left at least two people dead and hundreds of homes damaged has moved over the western coast of Thailand where its ferocity has dropped, the national weather service said Saturday. Six passengers – a man, four women and a baby girl – were killed and about 50 others injured when a double-decker tour bus heading from Roi-et’s Phanom Phrai district to Bangkok overturned in Khlong Luang district early Sunday, police said. The executive committee of the Democrat Party has approved the nomination of candidates to contest in 346 of the 350 constituencies nationwide in the forthcoming general election, party spokesman Thana Chiravinij said on Sunday. The government has reiterated its commitment to putting an end to the issue of informal loans or non-conventional debt, which it sees as an adversity faced by the poor and many agriculturists. The state budget for fiscal 2020 is set at 3.2 trillion baht, up 200 billion baht from fiscal 2019 ending Sept 30, 2019, with a budget deficit of 450 billion baht equal to that of the previous fiscal year. Kasikorn Research Center (K-Research) forecasts Thailand’s car exports in 2019 to grow by 1-4% to 1.15-1.18 million units as the country faces myriad negative factors from Europe and North America. The eldest son of Surin Pitsuwan is setting up a foundation named after the late former ASEAN secretary general to help promote education, diplomacy and human security. Consumer sentiment fell for a fourth straight month in December as the public fretted over the impact of the deepening US-China trade war and uncertainty surrounding Thailand’s political situation. The government that will be elected this year is being urged to focus more on R&D and long-term solutions for rice management policy and steer clear from pledging or price guarantee schemes. Thirteen students and four teachers of the famous Dhepsirin high school in Bangkok were trapped in a burning building on the campus before being rescued safely by firemen.